Here's a list of 10 things you might not know about Luke Skywalker who was portrayed wonderfully well by Mark Hamill. The original drafts for Star Wars show that the Skywalker family was actually called Starkiller. Indeed the drafts featured a General Starkiller and didn’t focus on the young moisture farmer from Tatooine. Does the name “Annikin Starkiller” sound familiar? That's the character's original name. The Force Awakens used the name Starkiller for the First Order's planetary based weapon. As the Rebels make their escape from their base on Hoth, it is Hamill who speaks the line, “the first transport is away!”. This line is later used as a reference to Star Wars in Mass Effect 3. Everyone assumes Luke only appeared in the three original Star Wars films. Think about it for a moment and you’ll realise Skywalker appears as a baby at the end of Revenge of the Sith following Padme Amidala giving birth to him and Leia at the medical facility on Poliss Massa. The character, of course, had a cameo in TFA and an extended role in The Last Jedi. In the extended universe books, Luke falls in love with Mara Jade and has a child called Ben, named in honour of Obi Wan Kenobi. This concept was nicked for The Force Awakens and Kylo Ren bears the Ben name. 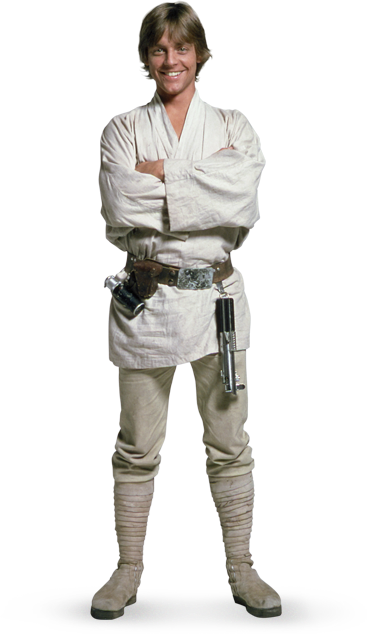 Luke Skywalker is 1.72 meters tall which means he is 63 cm taller than the little droid that could, R2D2. Threepio, tell them if they don't do as you wish, you'll become angry and use your magic! I'll not leave you here. I've got to save you. Mark Hamill never really set the film world alive post Star Wars, perhaps due to the strong association as him being Skywalker however in the last twenty years he has made a name for himself as a voice actor for many cartoons, most notably as Batman's nemesis, The Joker. While Luke Skywalker is right handed, Mark is actually a lefty. The way Mark Hamill got the part of Luke Skywalker is classic Hollywood. Robert Englund, who eventually became famous as dream killer Freddy Kruger, was auditioning for a part in Francis Coppala’s Apocalypse Now when he noticed auditions for Star Wars were also happening at the same time and he suggested to his young friend Hamill to audition. The rest is history. As an aside, it's interesting to note that even though Hamill never became as big as Harrison Ford in the box office earnings stakes, he's a much-loved actor - and in that sense is very similar to Star Trek's Leonard Nimoy - he was never able to escape that character and like Hamill, so embraced his identity as being Spock. Both have parlayed the close association to their characters into long-term careers with a hint of 'knowing' about them. Check out Hamill taking the mickey out of himself in Silent Bob and Jay Strike Back for instance.